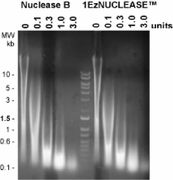 1EzNUCLEASE DNA & RNA Endonuclease is a proprietary E. coli preparation of the recombinant Serratia macescens extracellular endonuclease. This highly active enzyme digests single and double stranded nucleic acids into 5'-phosphorylated oligonucleotides that are 1-4 bases long. 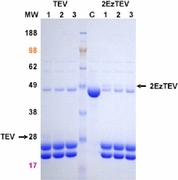 The 1EzNUCLEASE endonuclease makes it easier to handle and purify cell lysate components because it dramatically reduces sample viscosity via nucleic acids digestion.